Sold by Hammock Sky and Fulfilled by Amazon. Gift-wrap available. Plan begins at the end of the manufacturer's warranty. 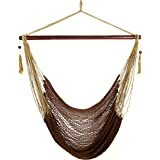 STRETCH OUT & FEEL WEIGHTLESS - Lay back and relax as you enjoy this roomy, soft and extra-comfortable hammock chair. The XXL size comes in three unique, soothing color tones to match your home décor - whether hanging indoor or outdoor on the porch, balcony, patio or yard. 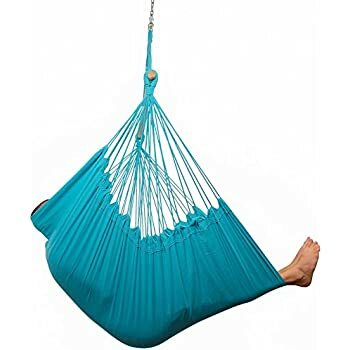 EXTRA COMFY JUMBO HAMMOCK CHAIR - Many hammock chairs force you to sit up due to their small size - you’ve never truly relaxed until you’ve tried this one! The larger 73-inch length and soft cotton fabric allow even a fully-grown adult to kick back and relax completely. GREAT FOR KIDS, FAMILIES & PETS - This hammock chair features a solid fabric bed that is impossible to fall through, meaning kids, pets and the whole family can lounge, enjoy and be safe at all times. The thicker spreader bar of this hammock chair also allows for a greater weight capacity of 330 lbs - unmatched by other chairs. 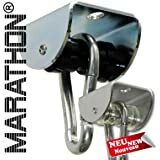 INCLUDES FREE HANGING HARDWARE & DRINK HOLDER - Your purchase includes TWO free bonuses! 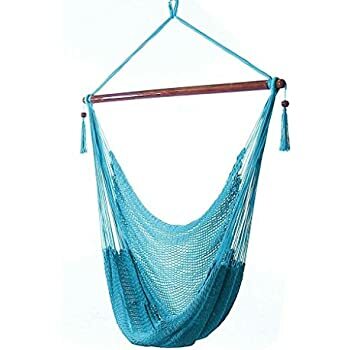 The complete hanging hardware (everything you need to hang the hammock chair) and a detachable hammock drink holder, so you can enjoy a cool beverage while you swing or relax. 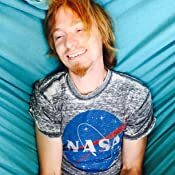 Sold by Hammock Sky and ships from Amazon Fulfillment. Sold by Impresa Products and ships from Amazon Fulfillment. Sold by www die-schaukel de and ships from Amazon Fulfillment. 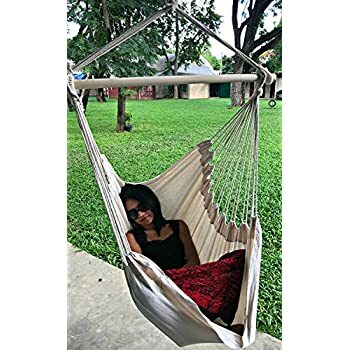 Giantex Adjustable Hammock Chair Stand Solid Steel Construction for Hammock Chairs and Swings, Height Adjust from 78.5" to 98.5"
Stretch out and feel weightless as you relax in this extra-large hammock chair… it practically feels like laying on a cloud. 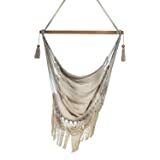 You can hang it indoor or outdoor on the patio, deck or in the yard, and it comes in three unique and soothing colors. You won’t find these anywhere else! 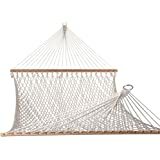 The extra-large, 73-inch long size of this hammock chair makes it the most comfortable you’ve ever tried. 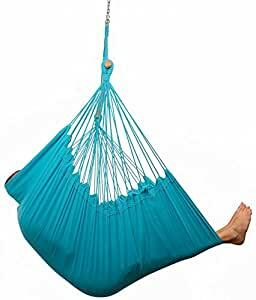 Combine this with extra-soft cotton fabric and you have a one-of-a-kind hammock chair, with room for a fully-grown adult to kick back and completely relax. 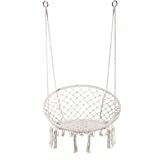 Some mesh hammocks, especially those with an open weave, can be dangerous for small children or pets. 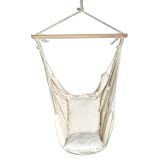 To ensure safety at all times, this hammock chair features a solid fabric bed that is impossible to fall through, and can withstand heavy use. This hammock chair also has a superior weight capacity of 330 lbs. 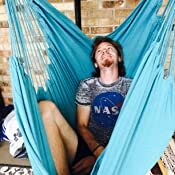 Hammock Sky has been selling hammocks and accessories for over a decade, and we’ve built up a reputation as one of the top sellers on the market with years of happy customers and positive feedback. Don’t be fooled by low quality imitation brands and always trust Hammock Sky for an excellent buying experience. 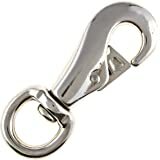 Your purchase includes the spreader bar and complete hanging hardware needed to set up your hammock chair - so there’s no extra hardware required. You’ll also get a drink holder for cold beer, cola or water to sip while you relax - included absolutely free! Don’t wait to order today! 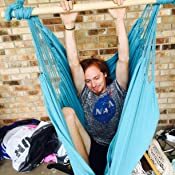 Click “Add to Cart” now to have your brand new jumbo sized XXL hammock chair shipped directly to your door! 5.0 out of 5 starsWARNING!!! WARNING. Buying one of these chairs will change your life. Stress and back pain will be a thing of the past. People will be jealous of your new found smile. Your beer will taste better. You will fight your children in an underground fight to the death to remain in control of the happiness this chair provides. Once you have defeated your children you will be able to fully relax in your new backyard that magically turned into a Zen garden. Buy the chair. 5.0 out of 5 starsBest for of alternative seating you can buy! The fabric is soft and has that fresh hammock smell. 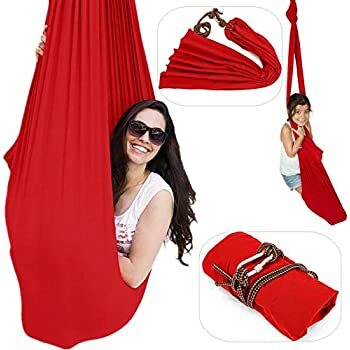 It feels great on your skin when you climb into it and unlike many net hanging chairs, it doesn't leave you feeling unstable or getting caught in the strings. The solid fabric gives a sense of privacy and maximum comfort and the knots don't shift at all, leaving me feeling very secure and able to commit to a nice peaceful relaxation without having to repeatedly check my knots and corners to be sure they were holding up. The hardware included is of the highest quality, though I myself have not yet used it with my stand. It came with a drink holder which I found adorable at first, but now has become an integral part of my hanging time as it will also hold a phone or any other gadget you want at arm's reach. If you're using an open rope chair or even any other hanging type, you are absolutely missing out. This is the first product I've I have ever been such a fanatic over despite being a very active Prime member. I will never order any other type of chair. 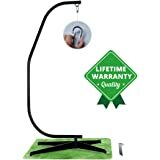 I use this product with a 7 foot stand and the initial hang was too low but it is very easy to adjust the swing by wrapping it around the wooden dowel it is hung from. It raises the height and hangs just as comfortably. You can even hang in the chair "backward" if you really want to stretch your legs out and up! Incredible swing and my new favorite thing. Will always be a fan. 5.0 out of 5 starsHammock chair + hammock = bliss! 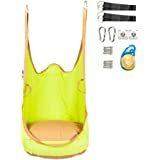 I tried a similar hammock chair from another company and returned it after the first use because it was not big enough nor comfortable enough for both me and my dog or my girlfriend. 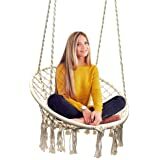 I'm over 6 feet tall and I already had a hammock from Hammock Sky so I checked Amazon and found they now have this awesome XXL chair so I gave it a swing! 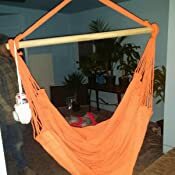 This purchase was perfect, and came with the hardware to hang it - it was so easy to set up and we are all very comfortable for hours in it, plus the materials are a lot more durable so I know it will last years and I love the beer/coffee holder! I moved my hammock to the porch and now have the hammock chair under the tree for reading and resting and couldn't be happier. Also the chair is super easy to take down to bring to the cottage on weekends... but I'll likely just buy a second one for this price. Thanks again Hammock Sky, I'll definitely recommend this to all my friends! SIMPLY AWESOME!! I can't believe how great this thing is! I was sceptical when I ordered it as I am not a small man (6'2" and 243 lbs) but this really is XXL and for once I can fit comfortably! 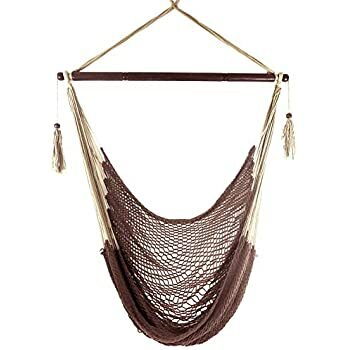 This replaces an old hammock chair I bought years ago so I didn't need the included hardware but it comes with everything you need to hang it up and it's much better quality so I may switch it out anyways. 4.0 out of 5 starsIndoor Tropical Paradise! This is a GREAT hammock chair! Delivery took 2 days & package was in perfect shape! We just purchased our first home & have a lot of remodeling to do! We want to turn our living room into a Tropical Paradise! This hammock will set off the room! We hung it off of a main beam that goes right to the middle to a baywindow. Once we paint & put hardwood floors down, I am going to surround the hammock with a lot of tropical plants & an indoor water feature. This hammock couldn't be more perfect. It is wide & durable. 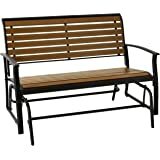 You can sit in it like a swing or stretch out to a reclining position (Just like the advertised picture.) Only reason I'm giving it 4 stars is because, I ordered the orange color(teal was out of stock) & it isn't as vibrant as the picture. It is more of a dull peach. It is still very beautiful & looks tropical! . The beer coozy & all the setup hardware is a huge plus!! Comes with everything you need except a drill. The chain is a good length so you can adjust to your liking. I would recommend 8ft+ ceiling height. 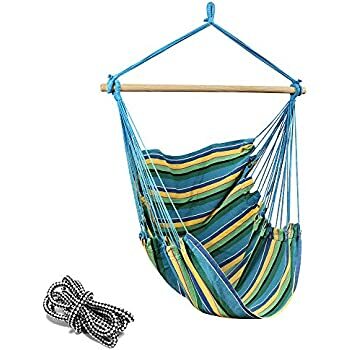 The top of the hammock where you put your S-hook is a swivel, so you can turn 360 degrees. That was a big deal for me, turn into the light to read a book or swivel the other way to watch TV. Hammock Sky also included a fridge magnet with a 20% off coupon to use yourself or give to a friend to share the magical experience. I looked at hammock chairs for months before making the commitment to this one. I am very glad I chose this one. Do not hesitate! Buy!! 5.0 out of 5 starsA large hammock chair that delivers! 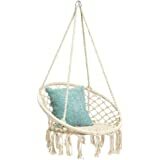 Was looking for a hammock chair where I could lie back fully, as opposed to having my legs spill out over the edge. This hammock meets that need! 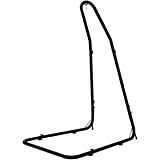 Its flexible in that you can use it as a chair, or pull the material out further and take a siesta. I've been enjoying using it for reading and using the laptop. Got this one in brown (or iced coffee on Amazon), but am thinking to get a second for my parents place, possibly in the teal color (limpet shell).